This is a case study of a patient with diffuse cerebral vasospasm following resection of schwannoma. A 16-year-old Chinese boy presented with dizziness and projectile vomiting for 3 months. He was admitted at the Neurosurgery Department of Beijing Tiantan Hospital in November 2009 after a progressive exacerbation of symptoms, with unsteady walking and increased blood pressure. Physical examination revealed lucidity, equal reaction of pupils to light, full eye movement, facial symmetry, lolling and muscle dystrophy of the left part of the tongue, bilateral gag hyporeflexia, soft neck, grade V limbs muscle strength, normal muscle tone, Rombergism positive, and bilaterally positive Babinski’s sign. Blood pressure was 142/110 mmHg. Computed tomography (CT) revealed an intracranial space-occupying lesion. Magnetic resonance imaging (MRI) confirmed the lesion (size: 2.5×2.0×2.0 cm) in the left part of the ventral medulla oblongata (Figure 1A). The lesion was significantly enhanced after contrast injection. The medulla oblongata was extruded, with peritumoral edema. The patient was a full-term delivery and had no family history of hypertension and coronary heart disease. Figure 1 Preoperative and postoperative findings by MRI and CT.
Notes: (A) Preoperative MRI scan showing the tumor located in the left part of the ventral medulla oblongata. (B) Postoperative day 1 CT scan showing no apparent ischemic infarct area. (C) Postoperative day 3 CT scan showing an ischemic infarction at the bilateral internal carotid arteries and the posterior cerebral artery. (D) Postoperative day 3 MRA showing stenosis in the siphon segment of the bilateral internal carotid arteries and distal segment of basilar artery, and the slender distal blood vessel. Cerebral artery showed a slender, segmental stricture. (E) Postoperative CT scan showing the progressively enlarged ischemic infarction area. (F) Postoperative CT scan showing decompressive craniectomy. Abbreviations: CT, computed tomography; MRA, magnetic resonance angiography; MRI, magnetic resonance imaging. 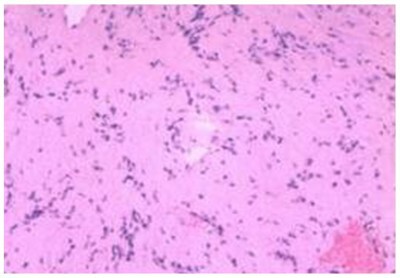 Figure 2 Photomicrograph of the tumor specimen. Note: Pathological examination was consistent with a schwannoma. At day 1 after surgery, the pupils were equally sensitive to light. Wound dressing was clean and dry. The patient presented airway obstruction, and tracheal intubation was performed to secure airway patency. The airway obstruction did not improve even two days after surgery. Hence, dehydration therapy and tracheotomy were performed in the supine position. Three days after surgery, the patient was in a hazy consciousness state. 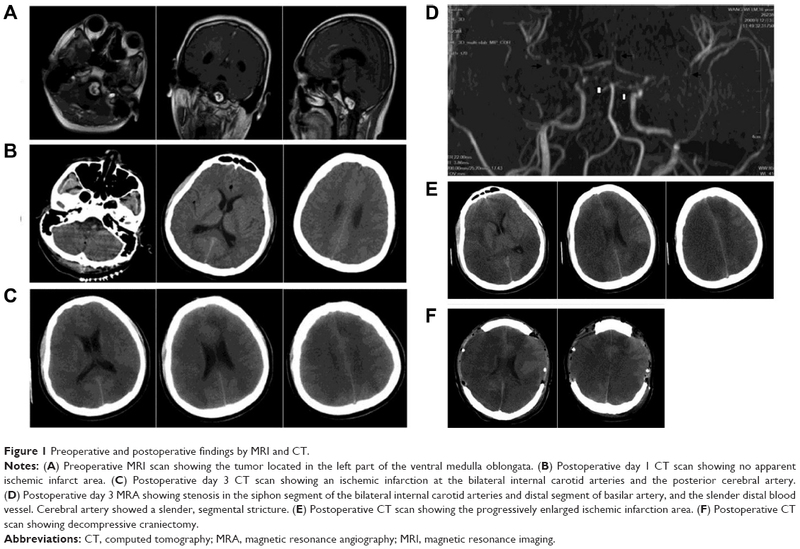 CT showed an ischemic infarction at the bilateral internal carotid arteries and posterior cerebral artery (Figure 1C), which was not present on day 1 (Figure 1B). Magnetic resonance angiography (MRA) showed stenosis at the carotid siphon and distal basilar artery, which was segmental (Figure 1D). Hyperdynamic hemodilutional therapy and nimodipine were started. Four days after surgery, the patient was in coma state. His body temperature was 39°C, and hence physical cooling was performed. Penicillin was replaced with vancomycin and ceftazidime. The patient received 50 mL of nimodipine q 12 h, hydroxyethyl starch 130/0.4, and 4.5 g of sodium chloride (500 mL/day), and the amount of fluid was increased to 3,000–3,500 mL/day. Five days after surgery, the level of consciousness of the patient was not improved. There was no clear liquid exudate at the incision. The dressing was clean and dry. Six days after surgery, the patient was unconscious. CT revealed that the infarction was located in the frontal, parietal, occipital, and temporal lobes (Figure 1E). Seven days after surgery, the level of consciousness was not improved. The infarction size increased. Dehydration therapy was carried out, without success. Decompressive craniectomy was successfully performed in the frontal and temporal parts (Figure 1F). Head dressing was clean and dry. The bone window was correctly replaced, the trachea incision was unobstructed, and the patient had small amounts of sputum. However, the patient was in a persistent vegetative state, with normal vital signs. The Karnofsky performance status score before surgery was 90. It was 30 on day 1 after surgery; 20 on day 2 after surgery; 10 on day 7 after surgery; and 40 on the last follow-up (ie, five years after surgery). In the present case, the tumor was completely resected without active bleeding, in contrast to what is sometimes seen in vasospasms after tumor resection.5,6 In addition, the cerebral vasospasm occurred three days after surgery, which is not consistent with the occurrence of SAH-associated vasospasm. On the other hand, direct mechanical trauma to the arterial wall (especially microvessels) during tumor resection was inevitable and could induce local arteries vasoconstriction, which would result in an intrinsic myogenic response, upregulated norepinephrine levels, or increased cerebrovascular reactivity to norepinephrine and serotonin.3 Contractility and elasticity of arterioles are better in young people, which might make them more sensitive to direct mechanical trauma. Indeed, older patients (≥68 years of age) with aneurysmal SAH have a lower incidence of symptomatic vasospasm.9 The occurrence of vasospasm in the present case might be secondary to the age-related response to mechanical stimulation or vasoactive substances. As far as we know, this is the first report of cerebral vasospasm after the resection of a schwannoma located in the ventral medulla, which is rare. Studies suggest that tumor location might contribute to the development of vasospasm,1,8,10–12 especially if the tumor is in the vicinity of the trigeminal nerve, A2 nucleus, and/or median eminence. A review suggests that pituitary tumors are most likely to induce the cerebral vasospasm.3 Indeed, MRI revealed that the lesion was in the left part of the ventral medulla oblongata, completely compressing the medulla oblongata, with edema. It is likely that tumor removal stimulated the A2 nucleus or the release of vasoactive substances from the tumor bed, affecting the postganglionic trigeminal system, A2 nucleus, and the median eminence. Aggressive treatment methods were used in the present case, preventing death, but not important morbidity. Therefore, the appropriateness of these treatments might be questionable, and prophylactic treatments might be more appropriate. However, there is no study about the use of vasodilator and cerebral perfusion after surgery of brainstem tumors. In the present study, the successful use of vasodilator, cerebral perfusion, and surgery were limited after the onset of cerebral vasospasm. JQ, LZ: substantial contributions to conception and design, acquisition of data, or analysis and interpretation of data. All authors contributed toward data analysis, drafting and revising the paper and agree to be accountable for all aspects of the work. Aoki N, Origitano TC, al-Mefty O. Vasospasm after resection of skull base tumors. Acta Neurochir (Wien). 1995;132(1–3):53–58. Lee TT, Ragheb J, Bruce JC, Altman N, Morrison G. Diffuse cerebral vasospasm with ischemia after resection of a cerebellopontine angle primitive neuroectodermal tumor in a child. Pediatr Neurosurg. 1998;29(6):300–303. Alotaibi NM, Lanzino G. Cerebral vasospasm following tumor resection. J Neurointerv Surg. 2013;5(5):413–418. Takei H, Schmiege L, Buckleair L, Goodman JC, Powell SZ. 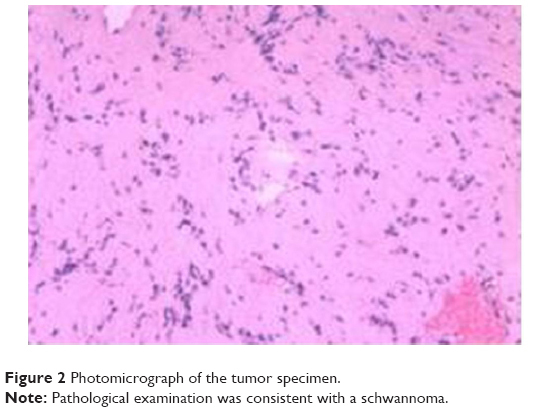 Intracerebral schwannoma clinically and radiologically mimicking meningioma. Pathol Int. 2005;55(8):514–519. Bejjani GK, Sekhar LN, Yost AM, Bank WO, Wright DC. Vasospasm after cranial base tumor resection: pathogenesis, diagnosis, and therapy. Surg Neurol. 1999;52(6):577–583. [discussion 583–574]. Prontera A, Puzzolante A, Carpeggiani P, Pavesi G. Symptomatic anterior cerebral artery vasospasm after brainstem hemangioblastoma resection. A case report. Neuroradiol J. 2014;27(2):186–190. Atalay B, Bolay H, Dalkara T, Soylemezoglu F, Oge K, Ozcan OE. Transcorneal stimulation of trigeminal nerve afferents to increase cerebral blood flow in rats with cerebral vasospasm: a noninvasive method to activate the trigeminovascular reflex. J Neurosurg. 2002;97(5):1179–1183. Jacob JT, Hunt CH, Wijdicks EF, Rabinstein AA, Cloft H, Link MJ. Diffuse cerebral vasospasm after resection of a posterior fossa ependymoma. Neurocrit Care. 2011;14(1):86–90. Torbey MT, Hauser TK, Bhardwaj A, et al. Effect of age on cerebral blood flow velocity and incidence of vasospasm after aneurysmal subarachnoid hemorrhage. Stroke. 2001;32(9):2005–2011. Chang SD, Yap OW, Adler JR Jr. Symptomatic vasospasm after resection of a suprasellar pilocytic astrocytoma: case report and possible pathogenesis. Surg Neurol. 1999;51(5):521–526. [discussion 526–527]. de Almeida GM, Bianco E, Souza AS. Vasospasm after acoustic neuroma removal. Surg Neurol. 1985;23(1):38–40. Barrow DL, Tindall GT. Loss of vision after transsphenoidal surgery. Neurosurgery. 1990;27(1):60–68.